Eddie Van Halen spent some quality FaceTime on February 6 with Carolina Beach, NC fan Michael Brewer as he battles terminal prostate cancer. WWAY Wilmington, NC reports Brewer was diagnosed with an auto-immune disease in 2013, and has since contracted chronic obstructive pulmonary disease (COPD) and prostate cancer that has metastasized to his bones. As a result, the 54-year old’s diagnosis is terminal as continues to receive palliative care at the city’s Lower Cape Fear Hospice. 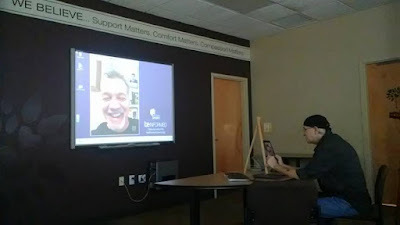 One of Brewer’s “bucket list” items was to meet the Van Halen guitarist, which he did this past Monday via FaceTime. "Soooo…this just happened!,” posted Brewer’s wife Julie on Facebook. “Eddie & his wife Janie were simply amazing! Felt like we were sitting and chatting with a close friend! Thanks to Eddie & Janie Van Halen & everyone at LCFH [Lower Cape Fear Hospice] for making Michael's dream come true! Eddie still has the best smile." Van Halen is a cancer survivor: he underwent treatment for tongue cancer in 2000 – including a surgery that removed roughly one third of his tongue – before he was declared cancer-free in 2002. The rocker also had two surgeries to remove cancer cells from his throat in 2011.